I LOVE Disney Land Paris. It is magical! I have an annual pass and go probably an average of once a month. Most of the time I go on my own with my 2 toddlers, and often with friends. It is totally do-able with little ones, so don't be daunted by the scale of Disney. And they can get so much from it, even when they are very young. My daughter has been going since she was only a few months old. Remember, if you can go before your children turn 3 - they are free!! It really is for absolutely all ages. I have so much to tell you about Disney that this post is going to be the first in a Disney Series. Here you will find my best general Disney tips, food advice and a Hotel we just love. At the end I will pop the links to the other ones too. You can subscribe here to Five Little Stars so you don't miss a thing we do! There are 2 Parks in Disney Land: Disney and the Studios. There is also the Disney Vilage, which is accessible without a ticket to the Parks, which is mostly restaurants and shops, as well as an iMax Cinema and the Buffalo Bill Show Ground. The key to fully making the most of and enjoying the magic of Disney is to PLAN PLAN PLAN! There is so much to do, and you will have paid a lot for your tickets, so you want to make sure that you really see and do as much as possible, without having overtired little ones. How best to plan? 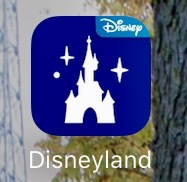 Disney has an App that you can download onto your phone which is really good, particularly for looking at the live queue times and show times. In Disney queuing is inevitable, so this helps you get smart! There are some rides which always have long queues, but at certain times of the year, and day, the parks get busier. Hopefully the rest of this blog series will help you decide what you want to do, and when. I always take a small backpack or cross body bag for my valuables, and then load up the pushchair with everything else. Then for every ride you can be super efficient and just release the kids and go, all you need to take is your small bag. I've never had anything stolen from the pushchair (but of course it's a risk and could happen) and I don't lock mine up either (a Bugaboo, or double McLaren, so potentially desirable). I have noticed most people do the same BUT I have heard a rumour that pushchairs are sometimes stolen. You can hire pushchairs too once you have entered the Park (check whether this is included if you have an annual pass). It is worth knowing that pushchairs are not allowed in the queues for rides, and some restaurants. Despite this I still always take mine to Disney, even though my 3 year old doesn't ever otherwise go in one. You will cover some serious distances by foot, and with all the excitement it can be tiring for even the most resilient little person. However, for significant periods of time you have to manage un-contained children. To keep it stress free, I use our Littlelife reigns for each child, which have a little bag too - I can keep a drink, snack, wipes and a nappy between the two I have. Always useful. Also I always take my Potette travel potty and stow it under the pushchair. When those toddlers want a wee - whilst there are many facilities around, they might not be convenient at that very second, and you don't want to waste time hunting for them, and certainly not queuing. Even older friends children have used it too. Disney is big and Disney is busy. Children can get lost. Always make sure your kids have your phone number on them somewhere. We have LittleLife ID bracelets for our two which has my mobile number in. But just as effective can be writing your phone number somewhere on them, e.g. in Biro up their arm. Have an "if you get lost" plan and a meeting point. There are Disney Cast Members everywhere, and they are all very friendly and willing to help. You can tell your children to ask them for help - I tell mine they are like the police for helping, and they always do what they say too (e.g. staying in place when waiting for the parade). If you are pregnant you must must must go to the City Hall information point and get a pass which allows you to skip all the queues. They limit it to you and your immediate family. You can get these just on the left as you first enter the Disney Park. If you're not pregnant, try and find a pregnant person to go with - you'll easily double if not more the number of rides you get to go on! There are several different types of Annual pass that you can get. We have had them for the last 2 years and BY MICKEY have we made the most of them! It is worth doing a careful comparison of what each different pass offers, as different ones restrict different days, and give you different discounts. With my second pass, I tried to economise, and *voila* the first time I tried to use it I hadn't checked and it was a restricted day on my pass. I ended up paying the difference to upgrade to an unrestricted pass. Take heed! There are often promotional perks from time to time too with guest discounted tickets, and for example, next weekend the Pirates of the Caribbean ride re opens - YAY My son's favourite - and we got a special queue jump invite. My lovely sister and I having some Disney fun times - it's for big kids too!! This is not literal - don't worry! It is a service offered whereby you can take turns on adult rides without having to queue twice. When I go to Disney with the kids, inevitably it is all about them and the rides they want to go on. I derive immense joy from their little faces, and my eyes have been known to leak when we meet characters, watch the parades, shows and fireworks, even if it is for the umpteenth time! It is just magic. However, Disney has a lot to offer for adults too, especially if you are like me and just LOVE big rollercoasters. This is where "Baby Switch" comes in. If you are there as a couple with kids, or with a friend, and want to do an adult ride, you can queue once then swap with the other person (who doesn't then have to queue). Just ask the cast member at the ride entrance about baby switch, and they will explain how it works for that ride. It does mean you have to go on the rides individually, but it saves some time and is worth knowing about. Off the main roundabout in front of the castle (to the right as you are looking at the castle) is the Baby Care Centre. As well as this being a first aid station, here they have nappies and baby food available for purchase. When I was visiting the parks and still breastfeeding my youngest, I didn't hesitate to feed her anywhere and everywhere, including in queues if the need arose. However, some people prefer somewhere a bit more calm and peaceful to sit and feed their baby, by whatever means, and the Baby Care Centre offers a space to do this. I did use it a couple of times when I was at Disney without my baby, and I needed to express some milk, and I was given a private room in which to do this which was great. Most of the toilets throughout the Disney Resort have changing tables for babies. My brother in law once told me: children are all about energy management: food and sleep. Oh how true this is, and particularly true for making Disney a success with little ones. It says at the entrance that you can't picnic in the park, BUT I have taken food in for the kids every time I have been, and have never been stopped or questioned. And take snacks. I need to know I always have something to hand for them, and me. When you have a pushchair its not hard to take all you will need for the day in the bottom basket. There are plenty of shaded spots to stop and refuel the family that should be convenient at a suitable stopping point mid fun! *Tip*: Eat at slightly unusual times if you can. If you are not eating when the majority of other people will be, you can catch some shorter queues when they are! The restaurants have super cute highchairs to use, with Mickey Mouse ears (although at very busy times you may have to wait for one). And Disney advertise that there are bottle warmers at all Disney restaurants. As far as food options in Disney go, for me, this is the most disappointing element of the Parks. The generally available food is either poor quality fast food (although not expensive), or really good but expensive (e.g. the character dining, or the Buffet restaurant just on the main roundabout, to the right). Sometimes we eat the fast food (the "english fish and chips", in the Toad Hall restaurant, or at the very back of Fantasy Land, to the right, sort of in front of "It's a Small World" there is a restaurant which does Pizza), but if we need food and have't got supplies, then usually I head out of the Park and into the Village. My favourites here are Planet Hollywood, followed by Rainforest Cafe (in that order, the kids would have the reverse favourites order!). It is with sadness I report that Cafe Mickey in the Disney Village is no longer Character Dining. We did this once last year, and it was easily the best dining experience we had. We all loved it. However it is now just a restaurant in the evening. I haven't been recently, but if the standards have been maintained then the food should still be good. I have heard very good things about the Inventions Character Dining, and also the Princess Dining - expensive but good quality food and a very special experience. Book in advance to avoid disappointment. I haven't yet tried the Ratatouille restaurant in the Studios, or the Pirates of the Caribbean restaurant (I would love to as this is my son's favourite ride) in Disney. I will update this when we have. And we are yet to do the Buffalo Bill show evening show with Dinner - it is next on my list when we have an occasion! Last, but certainly not least, by far the best way to do Disney with little ones is if you have the luxury of spreading it out over 2 or more days. The reason being that you are not under so much pressure to cram loads into one day, which could end up being a little bit stressful and tiring. Also if you want to go and see the AMAZING fireworks and laser show in the evening, it can be a good way to have a few hours down time from the park and be able to go back in later. This is obviously not necessary if you are prepared for a long day, but it makes it much easier. We were recently invited to stay at the Hôtel l'Elysée in Val d'Europe. I jumped at the opportunity to take the kids to go and see the Fireworks and Laser Show as we had not seen new 25th Anniversary Celebrations. My husband was to be away on business so I was going to take my 3 and 2 year old on my own.... it had to be as easy as possible. The timing was perfect as a birthday treat for my own little Elyse too. This modern and swanky hotel is a 5-10 minute drive, or free shuttle, to the Disney Parks and Village (even closer to the designer shopping outlet and Sea Life centre too!). Every member of staff was really friendly, the beds super comfy and the pillow menu option a nice touch. Possibly best of all though, the curtains were black out AND velcrowed to the wall at the sides so I got a lie in until 9am after the fireworks - yay. Our superior room was really big which made managing my toddlers on my own so much easier, and breakfast was yummy. It was thoughtful of the hotel to have a note and birthday macarons for my daughter in the room for us (she scoffed hers in about 0.9 seconds), so remember to let them know if your stay is for a special occasion, and the kids felt very grown up drinking their made-from-scratch lemonade mocktails in the lovely bar. It was a memorable stay and I would unhesitatingly recommend Hôtel l'Elysée for a special Disney break. Five Little Stars worthy. P.s. We were invited to stay at the featured Hotel above in exchange for an honest review. All views expressed are my own. 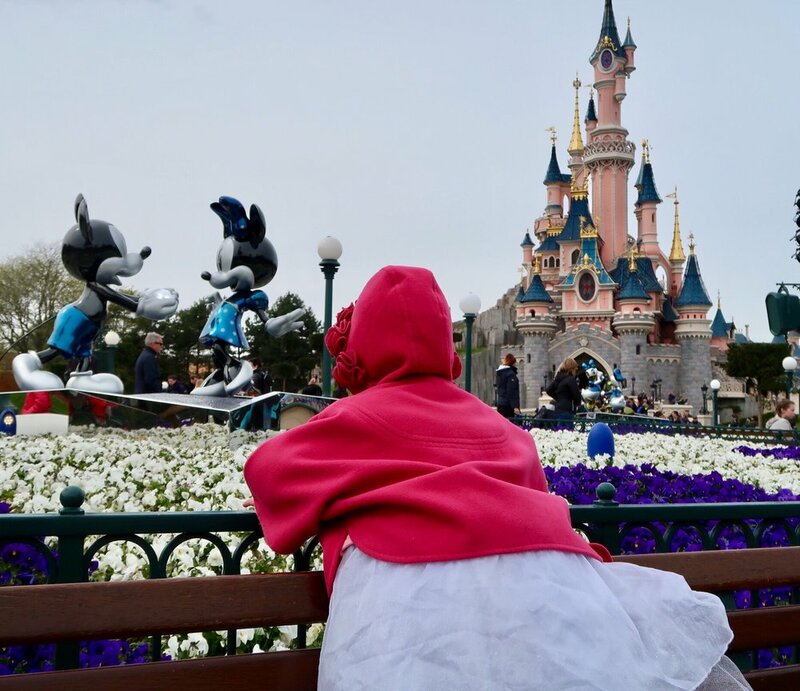 Disney Tips 2: What to pack for a day out at Disney with young children?